Italian dressing offers a healthier option to regular creamy dressings because it's naturally lower in calories and fat. Since it's high in sodium and the calories quickly add up, it's still important to watch the amount you eat. You won't get many nutrients from any salad dressing, but regular Italian dressing is a good source of vitamin K and healthy unsaturated fats that help prevent cardiovascular disease. Classic Italian salad dressing consists of vegetable oil and vinegar, with seasonings and flavorings such as honey and mustard. Depending on the brand, Italian dressing contains different types of oil and vinegar. You'll also find varieties that range from reduced fat dressings to salt-free and fat-free dressings, which means they contain a range of calories. The nutrition label on most salad dressings indicates that one serving equals 2 tablespoons. On the low end, 2 tablespoons of generic, fat-free Italian dressing have 13 calories, while regular Italian dressing without added salt contains 86 calories in the same portion, according to the U.S. Department of Agriculture National Nutrient Database. Fats from vegetable oil account for a majority of the calories in Italian dressing, except for fat-free brands. The fat-free varieties get most of their calories from carbohydrates. The total fat in 2 tablespoons of Italian dressing ranges from a trace amount in fat-free brands to 8 grams in regular, salt-free dressing. Regular Italian dressing contains 6 grams of fat in a 2-tablespoon serving, while reduced fat Italian dressing has 2 grams. The total fat consists primarily of healthy monounsaturated and polyunsaturated fats, which help lower cholesterol and reduce inflammation, according to Harvard Health Publications. You'll only get a significant amount of two nutrients from Italian dressing: sodium and vitamin K. Two tablespoons of regular Italian dressing supply 17 micrograms, or at least 14 percent of the recommended daily intake of vitamin K. It drops to barely a trace amount in fat-free brands, because you lose vitamin K, as the fat is removed. The sodium ranges from 267 to 316 milligrams in a 2-tablespoon serving in most types of Italian dressings, except those made without added salt. These values represent 18 to 21 percent of the recommended daily intake for sodium, which is 1,500 milligrams, according to the Institute of Medicine. You can significantly reduce the sodium by making your own Italian dressing. Vegetable oils are naturally low in sodium, and red wine and cider vinegars have fewer than 20 milligrams in 1 cup. Ladles used for scooping Italian dressing at the salad bar come in different sizes, but many hold more than 2 tablespoons. This makes it easy to consume more than you realize. 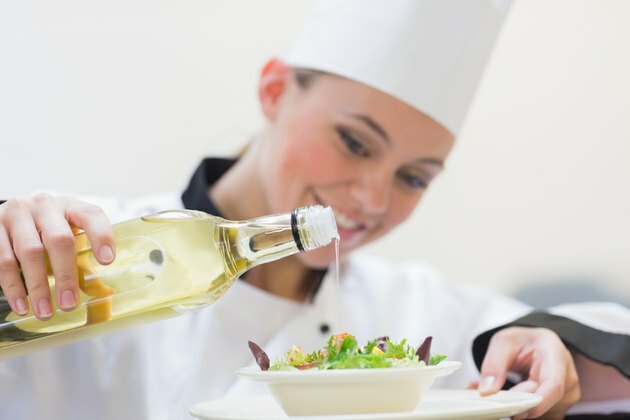 Italian dressings are healthier than creamy dressings, which replace some or all of the vegetable oil with ingredients such as mayonnaise and sour cream. In addition to containing more fat and calories, regular creamy dressings, such as Thousand Island, also have more artery-clogging saturated fat. How Many Calories Are in a Tuna & Mayo Sandwich?